Zitat: "In 2007 Heli, lead singer, songwriter, and the creative force behind the band Bedroom Chocolates, came up with the idea while working on a project in San Francisco, supported by Marcus ‘the Tone’ Cohen, an American Jazz trumpeter and composer. Martin, drummer and guitar player from Germany, stumbled into Heli’s project and the bedroom chocolates have been founded 2008. Petar, upright bass player from Croatia was the next who entered the Chocolates. 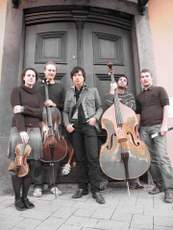 Sascha, viola player and trombone player and Wolfram, a cellist, joined both later after a renewal 2010. Susanne, a violin player, was the last, but definitely not least, to ‘jump into the Chocolates’ bedroom. Mutual love for chocolates and music unites these six talented individuals into a unique multicultural band. With their unusual style and invigorating performances, Heli, Martin, Petar, Sascha, Wolfram and Susanne reach out to the audience and trigger emotions and feelings that have been hidden for too long. The result is precisely that sound of music everyone has long been waiting for. Since the beginning of 2010 the new CD “horizon inc.” is out. (recorded with former band members Sophie and Maggy) The band is touring and searching for venues, sponsors and a suitable label." Hey, wir gastieren am Montag, 31.1.11 im Chelsea! Wär cool, wenn ihr dabei seid! Süße Grüße Eure Schokoladen. Unsere neue CD "horizon inc." ist endlich da. Hört mal rein!